Katharina Schroeder was born in Rosenthal, south Russia on March 7, 1895 to Peter Johann (1852–1920) and Maria (Klassen) (1855–1951) Schroeder. She attended the Mädchen Schule (girls school) where she learned to love music and poetry. At the age of twenty three, on March 22, 1918, she was married to Johan (Hans) Andres. In the following year a child was born to this couple. However times were hard with famine and disease. Her husband contracted typhus and died in April 1920, and in August of the same year, daughter Erika died. In October she also contracted the disease which brought her to the brink of death. She recovered and in 1921 was baptised at the local church. In 1926 she immigrated to Canada and settled in Morris, Manitoba. In 1931 she joined the Arnaud Mennonite Brethren church . After being a widow for the twenty three years, she married Jacob Klassen who was born in 1885. At this time they transferred their membership to the North Kildonan Mennonite Brethren church in Winnipeg. In 1952 she was widowed again when her husband died. Some time later she moved into Donwood manor where she lived until her death on July 22, 1985. The records in the collection came to the archives after Mrs. Klassen’s death. They were deposited here by Bert Friesen on July 15, 1986. 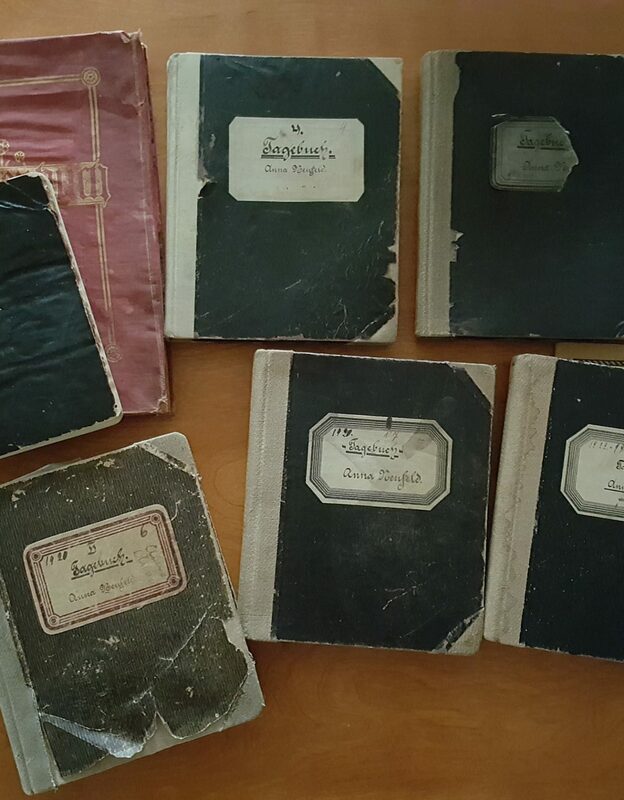 This collection consists of diaries, journals, correspondence, and poems that Katharina Klassen wrote and collected. The material in the scribblers are at times a mix of writings, which makes the labeling of them difficult. Most of the material is in German, and some is in the Gothic script. Described by Conrad Stoesz October 29, 1999. Funeral invitations and cloth remnants. – 1920. Notes and poems. – [ca. 1943, 1948, 19-]. Journal. – 1965, 1967, 1970, 1977, 1979. 2 Books of reflections and writings. – [ca. 1932–1952]. Life story. – [ca. 1960]. Life story, and journal. – 1971, 1975–1978. Dairy 1974–1977. – Note: Included is a loose letter dated 1932. Katharine Klassen “Meine Lebensgeschichte”. – 1979. – Note: This appears to be portions typed out from number 5. Begraebnisfeier von Jakob Klassen, Morris. – [ca. 1952]. Correspondence and excepts from Gerhard Schroeder’s manuscript. – 1978. Obituary of Katharina Klassen. – 1985.